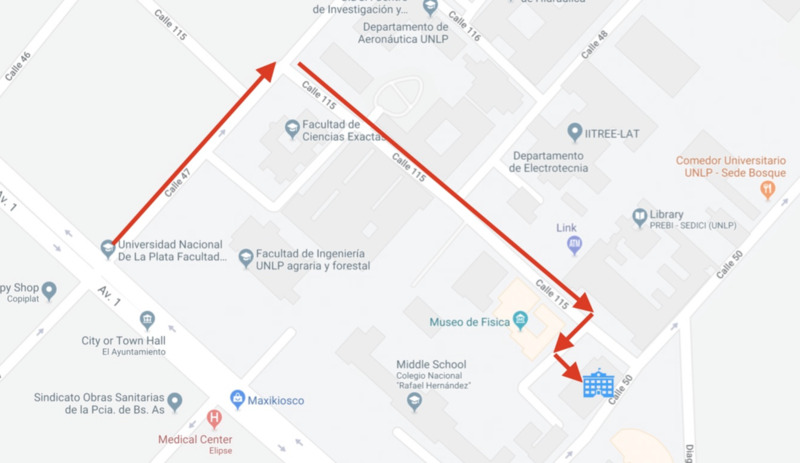 The School will take place in Aula 5 at the First floor of the Department of Mathematics, Facultad de Ciencias Exactas, UNLP. To use the public transportation you need to buy a prepaid/rechargeable card called SUBE and add some credit to it. La Plata is a big city, so it is good to take some precautions. Drivers may be very agressive, so be careful when crossing the street. It is usually safe to walk in touristic areas though you do not want to show up appealing electronic devices or to walk alone in the evening. There could be some pickpockets so it is good not to leave your belongings unattended in restaurants and bars, and -especially in buses- always keep your bagpack and purse in front of you, and your money in your front pocket. The usual precautions when traveling need to be applied here too. Thursday 19, 20:30 at Dionisio Restaurant (12 No. 835). Tickets cost 500ARS and include a three course menu with wine, soft drinks and coffee/tea. There is also a vegetarian menu for 400ARS.